Home > Replacement Filters → Sediment Hot Water Filter 10"
Sediment Hot Water Filter 10"x2.5". Five (5) micron removal of Sediment, rust and dirt. 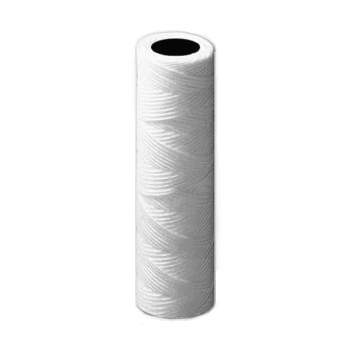 Polypropylene fibers with metal frame for purity and chemical stability. Meets FDA requirements for food and beverage contact. Suitable for filtration liquids (such as drinking water), compressed air and gases. Produced using precision winding patterns for high sediment removal efficiency and accurate micron rating. State of the art US-based computerized production facility eliminates product variations. Cost effective and proven against melt blown, spun and high resin-bonded cartridges. Fits standard 10x2.5 hot water filter housings. Rated for temperature up to 180° F (82.2° C). DO NOT USE IN HOT WATER ABOVE 140° F with a flow of more than several gallons per minute that may have significant quantities of rust/sediment.